The Graduate School of Intercultural Studies is a development and reorganization of the Graduate School of Human Science (hereinafter “the former department”). The following are employment and career placements from the Graduate School of Intercultural Studies (including the former department). The career of all master’s program graduates, separated by course, is below. Out of 51graduates, 33 have used the results of their research achievements to find employment. 7 are public officials, 3 are teachers, and the remaining work in various groups and corporations. Additionally, 11have progressed to doctoral programs and are set to become researchers. Our graduates, with their high linguistic and information processing abilities as well as a wide knowledge of intercultural studies, work in many different fields. For public officials, the South Korean Justice Ministry, the Palau Ministry of Art and Culture, Vietnamese government and more stand out among our students from overseas. For teachers, many make use of the specialties of their completed courses, teaching English, Japanese, Korean etc. Palau Ministry of Art and Culture, Korean Ministry of Justice, Thai embassy, UN Habitat (Asia-Pacific Regional Office), Vietnam governmental investment planning department, etc. Ministry of Defense ? linguistic work (English), Ministry of Finance Japan, National Museum of Ethnology, Kobe University International Communication Center (assistant), Kyoto University Research Reactor Institute (technical officer), Kobe University staff, etc. Hyogo Disaster Prevention Center, Hyogo Prefectural Police, Osaka City Hall, Nishinomiya City Modern History Researcher, Niigata City Hall, Art Center of Kobe, Hyogo Performing Arts Center, Kanagawa Prefecture Hayama Town Living Environment Department, etc. JICA (International Cooperation specialist), Japan Overseas Cooperation Volunteers (dispatched to El Salvador), Kansai Economic Federation, etc. Osaka, Hyogo,Tokyo, Hyogo, Okayama,Yamaguchi, Kagoshima, , Fukui, Kobe City etc. Himeji Dokkyo University lecturer, Kwansei Gakuin University full time lecturer, Kinki University special lecturer, Kobe Information University lecturer, Tama Art University assistant, China University of Political Science and Law lecturer, Latvia National University Japanese lecturer, Jeju University of Tourism lecturer, Kobe University Center for Collaborative Research and Technology researcher, etc. Beijing Parallel Economic Integration Center, ECC International Language Specialist School, Kenchukan Backup School, Daiichi Seminar, Kobe YMCA Institute Specialist School, The Japan Foundation Japanese-Language Institute Kansai Japanese Teacher, Kwansei Gakuin University Staff, etc. ANA, JTB, Kawasaki Kisen Kaisha, Hankyu Travel, Central Nippon Expressway Company, etc. Dentsu, Recruit Media Communications, etc. System Design, SCS, Hitachi System Engineer, Media Fusion, Goldman Sachs, NTT West Japan, NEC System Technology, Fujitsu FIP, Fujitsu BSC, Fujikura, etc. West Japan Railway Food Service Net, Kanetetsu Delica Foods, etc. Mitsubishi Heavy Industry, Sumitomo Rubber Industry, Fujitsu, Daihatsu Industry, NEC, YAMAHA, HP Japan, Hitachi Electric, Kawazoe Machine Works, Sharp, Teikoku Electric, Cosmo Oil, Bandai, Kobelco Systems, Nichidai Filters, Meiwa, Yazaki Corporation, Taiwan Hitachi Chemical company, Hirose Electric (Shanghai), etc. Kyodo News, Kobe Shimbunsha, The Sankei Shimbun, The Chunichi Shimbun, Kitanippon Shimbun, The Kyoto Shimbun, The Kochi Shimbun, MBS Radio, Kochi Cable Television etc. Kansai Philharmonic Orchestra, Higashi Honganji Temple (office),Mitsui-Tokyo UFJ Bank etc. Many graduates advance to our own doctoral programs and graduate schools of other universities. For an example in 2012, out of 51, 8 advanced to the doctoral program. In 2012, three of students completed the doctoral program have been hired as a professor of International Public University , a museum curator of Geihoku Folk Museum, and a researcher　of Intercultural Research Center, Graduate School of Intercultural Studies, Kobe University.In general, a certain number of others have found work in specialist schools, corporations or as public officials. 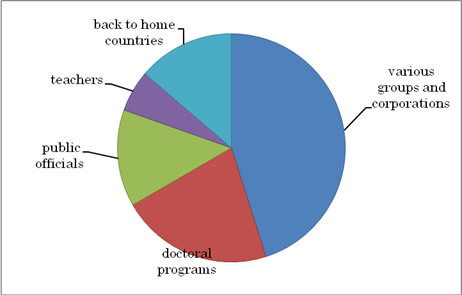 Many of graduates are employed as researchers and teachers in universities both in Japan and overseas. Tianjin Foreign Studies University, Qingdao University Faculty of Japanese Language Studies, Zhejiang University Department of Humanities, Yangon University Anthropology Department, Renmin University of China Foreign Language Faculty, Taiwan National Science Council – Centering Around the Humanities (full-time researcher), Dalian University of Foreign Languages Japanese Language Faculty teacher, etc. National and public universities etc. Kobe University International Student Center, Kobe University Centennial History editorial office, Kyoto University International Center, Fukui University Faculty of Education and Regional Studies, Numazu National College of Technology Liberal Arts, Kobe University Graduate School of Intercultural Studies etc. The University of Shimane Faculty of Nursing, Kobe City University of Foreign Studies, , Hyogo Prefectural Hygienic Academy, The University of Kitakyushu Foundation Center, etc. Osaka Institute of Technology exclusive lecturer, Ritsumeikan University College of Life Sciences specially appointed lecturer, Kinki university exclusive lecturer, Doshisha University exclusive lecturer, Poole Gakuin University Faculty of Intercultural Studies exclusive lecturer, Hiroshima Kokusai Gakuin University exclusive lecturer, Otsuma Women’s University Junior College Division assistant professor, Konan Women’s University associate professor, Shijonawate Gakuen Junior College exclusive lecturer, Hanazono University’s the Department of Creation and Expression full-time lecturer, Kobe Gakuin University Faculty of Business Administration exclusive lecturer, Kwansei Gakuin University Language Education Center associate professor, Kansai University Faculty of Letters specially appointed associate professor, Konan University Institute of Human Sciences researcher, Kobe Institute of Computing / Graduate School of Information Technology assistant, Mukogawa Women’s University exclusive lecturer, etc. The Kure Maritime Museum (as known as the Yamato Museum) curator, Hyogo Overseas Students Hall, Aeon, Kyoiku Kaihatsu Shuppan, Medikit, Kanaflex Corporation, AIST Human Welfare, Medical Engineering Research Institute Life Computer Science group (special researcher), CISTEC (exclusive researcher), Japan Foundation, Aichi Prefecture Nishio City Board of Education, Astellas Pharma, Fast Retailing, etc. The Intercultural Studies has its education on a core of career support and aims to be a unique research department that strengthens and smoothly propels careers through support activities. The Career Design Center (CDC) has an employment information room where you can read information relating to finding employment, employment guidance, employment experience presentations and other activities that the faculty or the graduate school will hold, discusses career situations with each individual student, and generally does all it can to support finding employment while working with every other disciplines.